Advantages of Full-Depth Pavement Reclamation | Asphalt pulverization | Rehabilitation | Benchmark Inc.
Save time, money, and the environment on your next asphalt paving project with full-depth pavement reclamation. 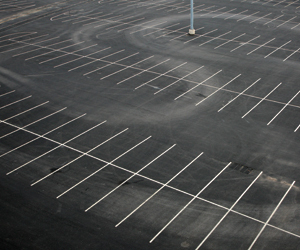 Asphalt parking lots and private roadways take a beating every day from constant vehicle traffic. Once pavement damage makes movement cumbersome or hazardous, it’s time to replace the surface material. To get the most out of your budget, while protecting natural resources, consider using a method called full-depth pavement reclamation. 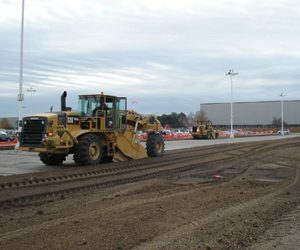 Also known as asphalt pulverization, full-depth reclamation is a construction rehabilitation technique of removing the distressed layer of existing asphalt, blending it with the existing stone base, and creating a recycled usable base for the new asphalt. This approach is best suited for large parking lots or private roadways that do not have a curb or gutter. Full-depth reclamation offers a host of benefits including lowered costs, an expedited schedule, and added structural benefits. You also have the opportunity to rehabilitate roadways and parking lots without full closure and extensive downtime, minimizing disruptions for users. The reclamation process reuses 100 percent of the existing material, conserving virgin materials and preventing hundreds of tons of waste material from going to the landfill. Asphalt pavement is commonly replaced by a process called full-depth removal and replacement. This operation exports the existing asphalt pavement, removes the existing stone base or dirt, and installs new stone base and asphalt pavement. The existing asphalt and stone materials are loaded by an excavator or loader and hauled off-site. All new stone base is transported back to the site with dump trucks. The removed asphalt is shipped to a local asphalt producer who crushes and reuses it in new asphalt pavement. The stone and dirt material are dealt with as waste. There is typically no value to the discarded material and often there is a disposal cost to the owner. The new stone base needed for the site is crushed from virgin material, loaded, and then shipped. Between the equipment, labor, and trucking needs for removal and installation, as well as material processing, the costs can add up quickly. Full-depth pavement reclamation, however, sidesteps many of these complications. The process uses a machine called a reclaimer or pulverizer that is equipped with an 8-foot-wide mandrel cutting wheel. At 58 inches in diameter, the wheel has 256 tungsten carbide teeth in a staggered pattern. The drum is positioned in the middle of the equipment, and spins in an upward cutting motion towards the back of the machine to mix and blend the existing asphalt and stone. A water and emulsion injection system adds water or a stabilizing agent during the mixing process to reduce dust and provide a more consistent finished product. As the pulverizer moves forward, the material is left behind in a flat fashion and is ready for a grader and roller to begin shaping the new elevations and slopes. BENEFITS Because reclamation can eliminate trucking, labor costs, and off-site processing fees, the technique will drastically impact your project costs. Depending on site size and conditions, using full depth reclamation as opposed to removal and replacement could generate a cost savings of over 50 percent. There are also positive benefits to the project’s schedule. Using removal and replacement for a site size of 54,000 square feet (a regulation football field), an average contractor might need three days to remove the asphalt, three days to extract the existing stone base, and two days to install the new stone base. This leaves the entire site out of service and inaccessible for over a week. If you used reclamation for that area, the operation would be on-site for less than two full days. The contractor can also strategically phase the project to allow limited access throughout the entire process compared to no access at all. As recycling becomes an important aspect to all industries, full-depth reclamation makes it simple for a pavement project to go green. 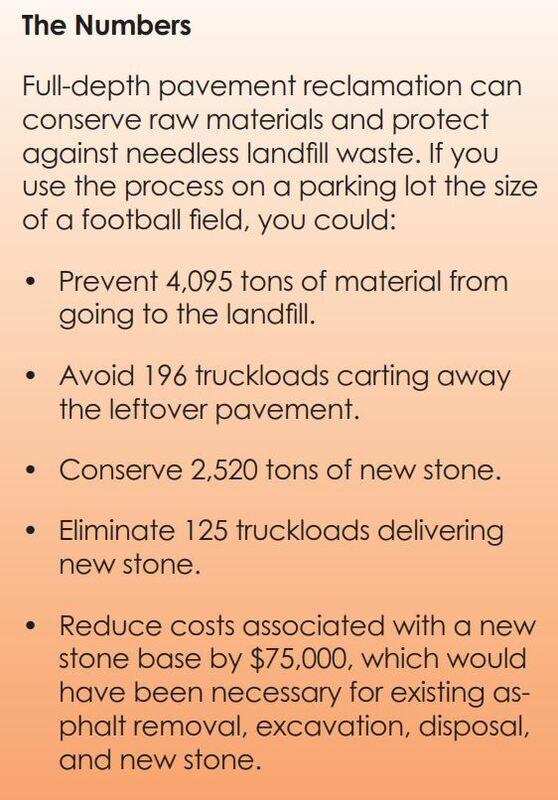 The existing asphalt and stone is 100 percent recycled without any waste products. By eliminating trucking and reducing operating times for on- and off-site equipment, it also reduces a project’s carbon footprint by reducing emissions and fuel consumption. Can the grades be raised in the area where the construction is taking place? If the answer is yes, then reclamation should be considered in the design scoping phase. If the site has controlling factors such as curb and gutter, buildings, or sidewalks that limit any adjustments of the grades, reclamation may not be the best choice. Is there sufficient asphalt and existing stone base thickness? Without sufficient material depth, reclamation may not provide the quality blended product needed to benefit from the initial cost savings. Are existing substrate and soils suitable for providing good support and longevity for the new pavement structure? Soil support, especially during construction, is critical to the success of full-depth reclamation. Factors such as soil type, consistency, and strength can be pre-determined through the use of past project experience and geotechnical studies. The area did not have any curbs and gutters or controlling factors except match points at the project limits. There was a need to regrade the area to help drain water off the pavement. Full closure of the roadway during construction was not an option. The existing pavement and aggregate base thicknesses were at least 12 inches on average throughout the road with stable soil conditions. By utilizing virgin stone material, it added a larger stone to the blend, giving the final blended product a more solid structure with both small and larger stone incorporated into it. Once the reclaimer had completed an area, the contractor began to shape and grade the material. In less than one day, the contractor was able to reclaim the 1,050-foot outbound lane, switch traffic over, and reclaim the inbound lane. The balance of the day was spent finishing grading the roadway to meet resloping objectives and compacting to achieve specified requirements. The paving crew was onsite before lunch the following day to pave the binder course. Thanks to full-depth reclamation, proper phasing, and traffic control, a constant flow of traffic and access to the site was maintained throughout the entire construction process.